We look forward to the 2018-2019 school year. In order to be prepared for the first day, the sixth grade teachers are requesting that students bring the following items listed on our supply list. 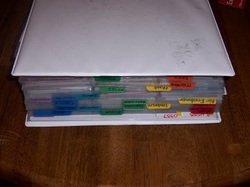 The three-ring binder is the most effective tool for students to organize and maintain information for processing. Materials can be added, deleted, and placed in proper sequence with a three-ring binder. Sixth grade requires a 1 to 1 ½ inch three-ring binder. Successful students attend class with proper materials—textbooks, three-ring binder, pencil, paper, and homework. Students can bring earbuds or earphones for use with chromebooks.